I remember the days when a quick trip down to the local corner store with a pocketful of change would net me some double bungers, a few mini skyrockets, and a couple of packets of tom thumbs. If I'd done some extra odd jobs around the house, I may have even had the extra cash for a few exotic luxuries like an aurora fountain, a diamond torch or even a colored aviation lamp. Although we'd usually let a few of the noisy guys off in the late afternoon (you know, the thunder bunger under the soup can, to see if it would make it to the moon), the most spectacular events were saved for nightfall. Psychedelic pinwheels nailed to an old fence post, spitting sparks like some deranged dragon; squat little flowerpots, tilled gently into the soil of the backyard vegetable garden, blossoming suddenly in a violent spray of endless colors; top heavy skyrockets, launched from cylindrical glass gantries (known as milk bottles to us earthlings), paper astronauts on a one way fiery ride. Those mini packs of child sized fireworks w ere just as much fun to me as any toy could be. An enormous amount of play value could be got from them, and certainly the fond memories of their incandescent power create a yearning nostalgia for those innocent childhood days now lost, a warm glow which bares an uncanny resemblance to that feeling of recollection of a favorite childhood toy. Ironically, these fondly regarded explosive playthings were often the undoing of many once coveted treasures from their owner's toybox: "I wonder how tough 'Big Jim' really is?" POW! "Goodbye, Bond. Let's see if your Aston Martin can survive this!" BANG! "That's correct, Professor. The only way to destroy a Werewolf is with a Silver Bunger!" KABOOM! And that was the end of my Aurora model kit of Lon Chaney Jr. as the Wolfman. Some masking tape, one match and five seconds later... instant plastic dismemberment. Military model kits were probably highest on the hit list of likely targets for crackernight combustion. Tanks, bombers, fighter planes from both World Wars: axis and allies alike were all under threat from this unseen new enemy... the smiling kid with the firecracker. And what a strange conundrum this scenario is, when you stop and think about it... hours and hours of meticulous tongue-poking, eye-squinting concentration spent with airplane glue and hobby paint, bringing a semblance of life to a jumble of plastic, only to end it all in a fiery microsecond of miniature thunder. A secret society of adolescent Doctor Frankensteins, heck-bent on destroying their own creations (I'm sure there's a Ph.D. in this for some budding sociology student). 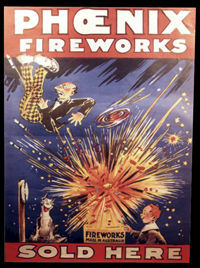 Despite their ephemeral nature, it is still possible to come across some classic vintage fireworks, but more likely dead than alive. 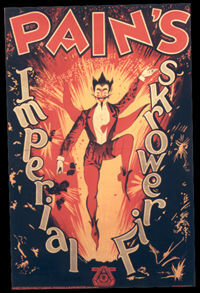 Bungers, tom thumbs, and other explosive types are sadly gone forever once used, but other more graceful members of the Guy Fawkes family often left collectable remains behind. 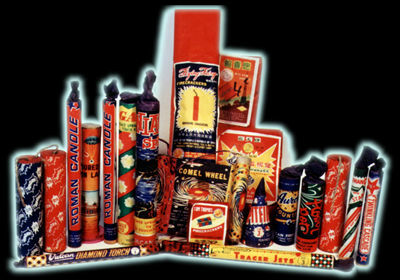 Some of the fireworks based on spewing forth colorful lights did not explode after their show and left a hollow cardboard tube behind. These were often decorated with brightly lithographed paper labels, designed to make them stand out at the point of sale, long before detonation. Often, these jazzy wrappings were left almost fully intact. The same could be said for most skyrockets, but being able to track their empty shells is another game altogether. 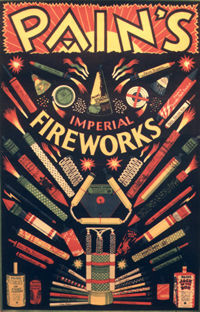 Promotional material associated with the sale of fireworks was often more dazzling and powerful than the real thing. Window displays were outrageously colorful, with overly bright posters designed to lure unsuspecting children. 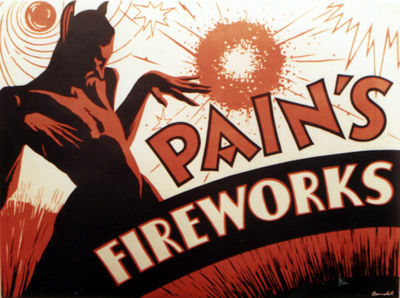 Some of the most dramatic and striking poster art can be found in material from "way back when" in the 1930's, as can be seen in the illustrations of Phoenix and Pain's brand fireworks posters. Amusingly, their national origins are given away by their varied art styles. Phoenix brand posters couldn't hide their Australian exuberance if they wrapped themselves in brown paper, whereas Pain's, despite their fantastic graphics, have an underlying British element of gentility. Fun though it was for me, fireworks night is no more. For better or worse, I grew up. So goodbye Roman candles... goodbye skyrockets... goodbye "May Be Held In Gloved Hand". The night may be gone, but the fond and fiery memories remain (you know, the stump still tingles in the winter...).